From l. to r.) Bruce Rogow, NSU Law Professor Emeritus; Martin Press, NSU Trustee; NSU President Dr. George L. Hanbury, and (far right) Jon Garon, dean of the Shepard Broad College of Law, with newly admitted to Supreme Court lawyers Lisa Goldberg, Joseph Natiello, Nathaniel Flinchbaugh, Tara Campion, Steven Farbman, Jane West, Michael Pascucci, Michael Ehren, Adam Schloss, Benjamin Lopatin and Joshua Eggnatz. Emmanuela Charles, was also admitted but is not pictured. 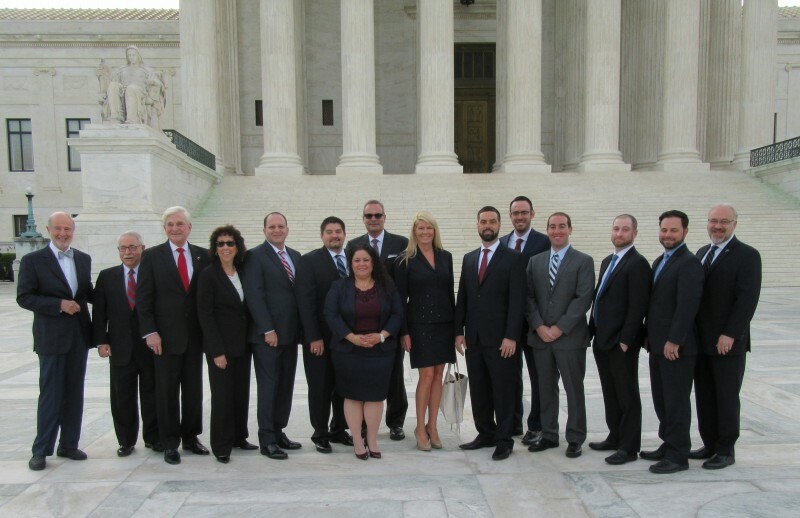 Twelve alumni from NSU’s Shepard Broad College of Law Center recently went to the U.S. Supreme Court to be sworn in as lawyers who can practice before the highest court in the land. Leading the group were NSU President Dr. George L. Hanbury; Jon Garon, dean of the Shepard Broad College of Law; Martin Press, member, NSU Board of Trustees; Susan Stephan, director of development, College of Law; Sharon Sullivan, executive director, advancement and alumni relations; Elena Minicucci, director alumni relations, College of Law, and Bruce Rogow, professor of law emeritus. The alumni, along with their guests and NSU representatives, were escorted into the Supreme Court and seated before the eight justices. Rogow created the motion for admission into the Court, and Chief Justice John Roberts administered the oath. To be accepted and permitted to practice before the Supreme Court, applicants must have obtained at least three years of active experience within a state bar and must be in good standing with that state’s bar. Along with submitting a certificate of good standing from a clerk or officer of the candidate’s respective state’s highest court, a candidate must also have certified sponsorship from at least two members of the bar of the Supreme Court. While it is required the sponsors have a personal relationship with the candidate, they are not allowed to be blood- or marriage-related. Candidates are inducted bi-annually.